1 of 1 In a small lidded pot, whisk together milk, cocoa and mint syrup until hot and slightly foamy. Pour into a mug with espresso. 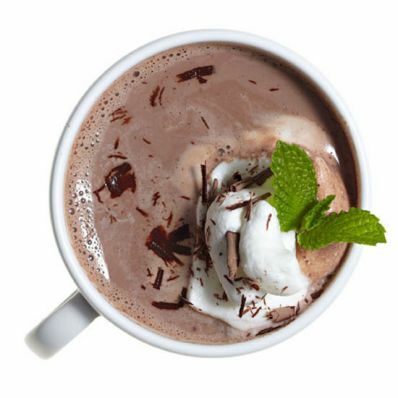 Top with whipped cream, chocolate curls and a mint sprig, if desired. 1 of 1 In a small lidded pot, combine 1 cup sugar , 1 cup water and 1 cup fresh mint . Bring to a boil. Turn off heat and cover. Steep 1 hour. Strain and place in a resealable container in the refrigerator for up to 2 weeks.